Rooted in protest, Vetted depicts life as a Muslim and Indian-American in the Trump era. Whether it’s folk, rock, hip-hop, or soul, music has seen a long and storied history in going hand-in-hand with activism. From Joan Baez’s popularization of “We Shall Overcome” to 2Pac’s “I Wonder If Heaven Had a Ghetto”, a slew of modern artists and tunes have been following suit when it comes to these staple songs of social protest to continue shining a spotlight on timeless issues. Such was the intent of modern soul artist and activist Zeshan B, whose cover of George Perkins’s “Cryin’ in the Streets” made the rounds over social media for his music video’s evocative portrayal of protests against oppression. 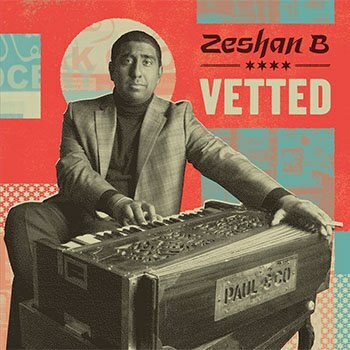 Vetted is the full encompassment of Zeshan B’s vision for an album depicting his life as a Muslim and Indian-American in the Trump era. With vibrant production courtesy of Lester Snell (the Staples Singers), B offers his world-worn croon to original songs and covers in English, Punjabi, and Urdu. When he sets his sights on government infractions through the eyes of an activist who has stood with Black Lives Matter, the Women’s March, and Standing Rock during darker days for America and the world at large, he does so with undeniable heart-rending soul. Vetted is an album for the awoken, as well as those who still need to be shaken by the shoulders a bit to wake up.